Welcome to The Original Italian Pie! As our business grew and our menu expanded, The Pie began to be known for our variety of delicious authentic Italian dishes, in addition to our outstanding gourmet pizzas. So when you hear us say, “You gotta try The Pie”… we are The Pie! 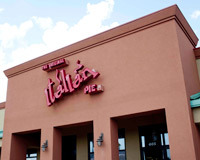 Serving gourmet pizzas and Italian specialties with a New Orleans kick since 1992. Our new The Original Italian Pie 2GO model has the same authentic Italian dishes as our full service model. Our new limited 2GO desires a much smaller footprint or leased space, a decreased number in manpower needed and an overall lower investment. The Original Italian Pie 2GO focus is the carry-out, catering and delivery segment. Our mouth-watering selection of Italian cuisines from traditional pasta dishes to calzones, wraps, sandwiches, gourmet pizza and fresh salads make great home replacement meals that can be called in and picked up or delivered to your home or business. The Original Italian Pie 2GO can also cater your larger party or function. For more information, please visit our Franchise Information section of The Original Italian Pie website. Easy and convenient online ordering for pickup or delivery. The Original Italian Pie Restaurant gift certificates make perfect gifts for holidays, anniversaries, birthdays, or any special occasion. Gift certificates can be purchased at Italian Pie Restaurants. Help raise money for needed programs, materials or equipment by setting up a “Fundraiser Night” for your school or organization at Italian Pie! On that night, anyone mentioning your school or organization’s name at the restaurant or when calling in a carry out or dellivery order will automatically help raise money for your shool or organization. The original Italian Pie will donate a generous percentage of all proceeds from these orders to your school or organization! In fact, you can set up several “Fundraiser Nights” throughout the year to make the most of this fund raising opportunity.